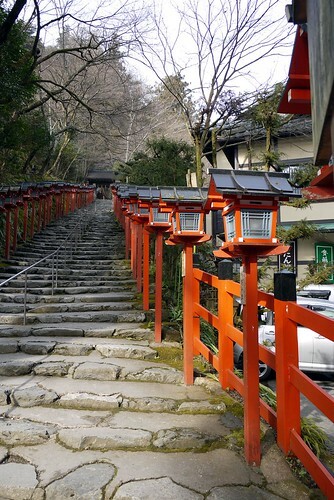 For my first full day in Kyoto I decided to… leave Kyoto. I took a small, suburban railway up to Kibune Guchi then walked uphill for about half an hour to reach Kifune Shrine in Kibune. Apparently the spirit enshrined there is not exactly the spirit of water itself, but rather the provider of water to others (as in rivers, rainfall, and so on.) Anyway, I bought my oracle, which came on a piece of paper with blank boxes. Soaking it in the provided trough revealed my fortune, which according to a Japanese man I asked was “middle lucky.” He was unhappy – his was bad. I had an extremely tasty bowl of tempura ramen at one of the two open restaurants in Kurama, with a cup of amazake afterwards. This is a sweet, non-alcoholic drink made from fermented rice. Then I headed to Kurama Onsen, a hotspring resort about 10 minutes walk out of town, and soaked in the water for about 2 hours while the sun set over the hills. After all that, I finally headed back to Kyoto for more ramen then sleep. The next day I had the chance to experience a different kind of beauty in the form of a tea ceremony at Gion Corner, a local centre dedicated to preserving and promoting Japanese traditions. I am sadly not well versed in tea ceremony protocol, but this one was geared towards tourists and they explained everything in Japanese and English. 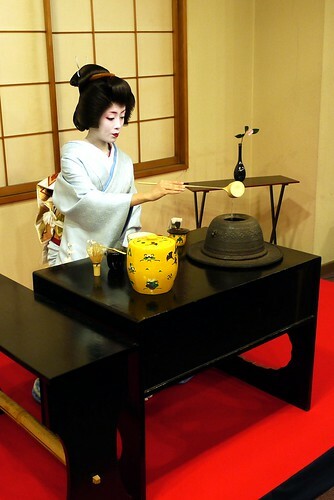 The best part was that the tea was prepared by a Geiko (Geisha) and served by a pair of Maiko (apprentice Geisha.) Geiko and Maiko are breathtakingly beautiful in a way that is impossible to show in photos or, really, describe. Also the way the Geiko prepared the tea was amazing in the perfect way she moved – everything exactly right, lots of steps, but no wasted motions. I just rearranged my plans so I can attend the Yamayaki fire festival in Nara tomorrow! I made it there in about 90 minutes. The ride home only took about 40 because I knew where I was going. 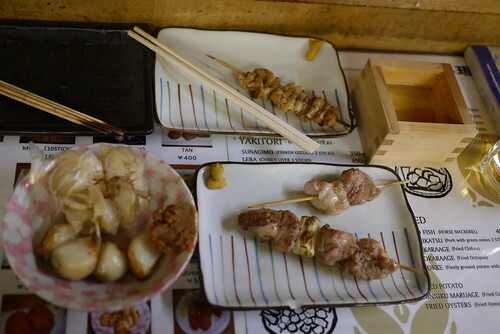 The stuff in the middle is kushikatsu, a regional speciality. It’s battered and deep fried food of all sorts. From L to R: quail egg, shrimp, beef, Kansai green pepper, chicken. 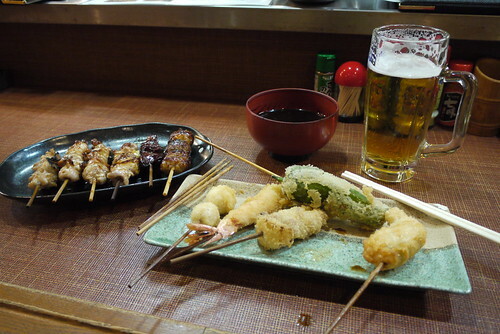 The stuff on the left is yakitori, which wasn’t as good as the time I went to Yurakucho. Kushi means (more or less) “skewered.” You’ll love the kanji for it: 串. Nom! On my last day in Tokyo, I got out of the city a bit to visit a geocache in a park at Machida. This was about a 30 minute train ride away from the Yamanote line on a private train service run by Odakyu, whose main business is department stores. The train ride was uneventful, and finding the geocache was reasonable… considering I don’t have a GPS with me. I armed myself with Google street maps and satellite views – sadly I couldn’t find a topo – and set off. It took me about 30 minutes to find the park, basically walking street by street and checking every landmark against the street map. Once in the park, finding the cache was easy – it was just to the left of a path. The highlight of the trip though was the awesome water art pictured to the right… it’s a seesaw that works by water action. It’s balanced (and I think spring loaded) to sit horizontally, but the weight of the water flowing from the top of the fountain eventually causes it to tip over… and splash the water down, at which time it starts to seesaw back up. There are 2 independent arms, and the whole thing rotates slowly as well. Very impressive. 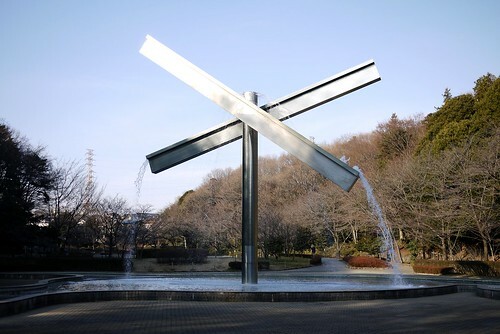 Water art is almost as neat as fire art, and it can safely run unattended like this sculpture! We love snow!, originally uploaded by scjody. I said I wished it would snow while I was in Tokyo (I still do – it only snows every few years.) This isn’t what I meant though. I found these guys on a random walk through Shibuya (the “city” in Tokyo where I live) on Age Day. This is the day when everyone who’s turned 20 in the past year is invited to attend a “coming of age” ceremony, usually at the local city hall. The fun part is that many of the attendees were dressed in traditional Japanese Kimono. Anyway, these guys were different. 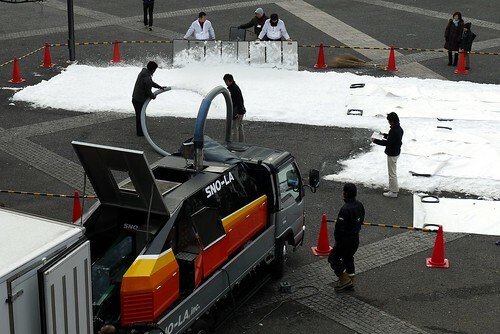 They were making snow using a machine that crushes ice and blows it out. Then, as far as I can tell, the plan was to paint “WE L♥VE SNOW” on it and take photos of people standing on it as part of something complicated called an “Eco-Action.” A google-translated article is here. Enjoy a taste of the WTF that is Tokyo! Well, we tried. I saw a post on couchsurfing with plans for a pantsless train ride, part of No Pants 2010 organized by Improv Everythingwhere. The consensus among some Japanese people I talked to the night before is that it would mostly be foreigners – the concept is a bit weird for Japanese. 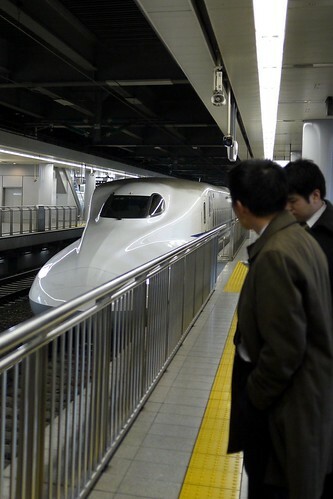 The chosen train line was the Yamanote Line, which is probably Tokyo’s busiest train line. It runs in a big loop around central Tokyo – anything important is on the Yamanote Line, or one train connection away from it. So yeah. No no pants ride. After the ride we headed to Yoyogi Park as planned. At least 2 people at the park had actually managed to board the train without pants, and in both cases they were detained and yelled at (but not arrested) by the police. They also kept several people off the car by simply blocking the doors when they saw someone on the platform without pants. We took some pantsless photos in the park, then headed to an Izakaya (Japanese style pub) where drinking and more pantslessness ensued. And that was that. Here’s a news article in English – it has links to an article in Asahi Shimbun, Japan’s largest newspaper, and a blog, where commenters mostly thought that the police response was a complete waste of police overtime and public money. We think that “honest man” on the Facebook event tipped off the police. From what I’ve heard, last halloween there was a party on the Yamanote Line where a bunch of Japanese people took the social convention of “anything goes when you’re drunk” a bit too far and smashed up the inside of the train car. So when the police heard of another weird event on the Yamanote, they reacted. We may try again. This time it will be invite-only, details by email to people whom the organizers have met and checked out. And it won’t be on the Yamanote Line. My last few days in Tokyo were interesting. It was nice to be able to explore the city a bit while being free of work (last Friday was my last day.) Highlights were finding the Pink Cow, a bar run by an ex-Californian, finally making it to a public bath (I think this one was an onsen but I’m not positive), and locating a geocache in a suburban park with an AWESOME fountain. I decided I wanted Yakitori (meat on a stick, literally “roasted bird”) for dinner, and Just In Tokyo suggested I find one of the many restaurants near Yurakucho Station. I chose the busiest restaurant (which was relative – 6PM is early for dinner it seems) and it was excellent. Great food, friendly service, and as a bonus, new year’s Sake. The server explained that it’s a Japanese tradition at New Years to have a barrel of sake and serve a free drink to every customer on their first visit in the year. It came in a traditional wooden cup and tasted excellent! So yeah, Akemashite Omedetou. I may be spelling that completely wrong, but it’s Happy New Year in Japanese… I learned that on a fairly random new year’s eve, when I met up with some couchsurfers a few hours after my plane landed. The evening included dinner at an izakaya (traditional Japanese pub), wandering around the streets, champagne from a convenience store, bars, and karaoke. Somehow, I finished the evening with a completely different group of people than I started with. Which was fine :) Oh, and the trains were running all night, which was good because I didn’t want to have to deal with taxis on my first night in town. My mission in Roppongi was to find cheesecake (it’s always good to have a mission.) I found a Starbucks about 3 minutes out of the subway station, but decided that was too easy and kept walking. I finally found a French restaurant that served me some – and then braved the touts again on the way to the subway station, 2 stops from home. LABEL: 8/10. 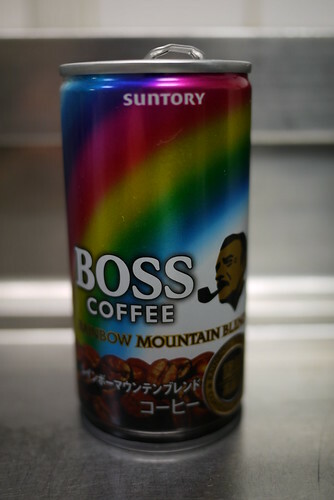 You have a rainbow, you have some coffee beans, you have the BOSS, a surly character. The label also promises Guatemalan Coffee, which Verbel Kint in The Usual Suspects says is the best coffee in the world. TEMPERATURE: 8/10. It came from a vending machine in a can, and it was warm. I love this country! Not as warm as it could have been though – perhaps the machine was miscalibrated. TASTE: 6/10. Drinkable, but whatever it’s sweetened with is a bit unpleasant. (Tastes a bit like corn syrup, but I don’t think it is.) Doesn’t really taste Guatemalan either. POTENCY: 3/10. It woke me up a bit, but I needed a double espresso from Starbucks to stop me from falling asleep 2 hours later. OVERALL: 6/10. Would buy again, but only if the other coffees were sold out. by scjody in 2010 Asia/etc. I love getting & sending postcards, and I’m in Tokyo for a while… therefore: postcards for postcards. Send me your address – even if you sent it before because I don’t have it now. You need international postage. Currently $1.65 in Canada – you can’t just stick a “P” stamp on. Well, you could stick 4 “P” stamps on, but that would be wasteful. Write the address and stick the stamp on before you write anything else, or you might forget and run out of room. If you ever have to write a bunch of postcards, it’s more fun if you get good and drunk first! Bought a notebook for $35. Not a special notebook – last time I bought something similar, it was $6 at Staples. Took a subway line I’d never heard of, that wasn’t even on my map. Found Shibuya’s Love Hotel Hill. Finally saw Hachikō the dog. Looked at cheap bicycles at the Walmart of Japan. Bought a cheap bicycle from the Honest Ed’s of Japan. Spent over $20 in train tickets just getting around Tokyo. More later… right now, I’m tired.